This tree stands in front of the Peabody library along the Esplanade, south of the walkway that leads to the library's front doot. White oak leaves are fairly easy to recognize because of their large, rounded lobes. Their acorns have caps with a pebbly surface. The bark of large white oak trees is distinctive, with a grayish color and long, rounded, loose plates. White oak is common in the wild in middle Tennessee. 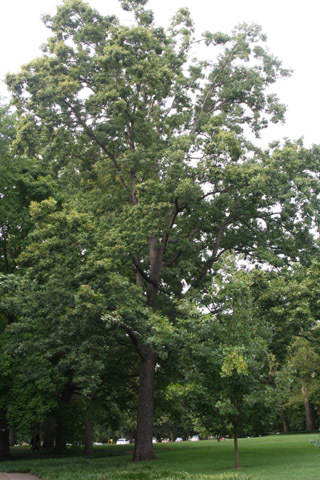 It is a commonly planted oak on Vanderbilt campus Its leaves and acorn are symbols of the university. This organism is a living specimen that is part of the  Vanderbilt University Arboretum  with the local identifier 1-38.